The Anime Archivist: Video Backlog: "Machine Robo: Revenge of Cronos"
I often wonder how companies come to release some titles. Are they because they’re cheap? Are they forced to release certain titles under contract because of another title they bought? This show is one such mystery. Originally released in 1997 by pre-CPM Software Sculptures, I believe this show got as far as 10 episodes out of 47 on tape before halting. A (then) decade old sub only show based on a toy line that practically no anime had heard of. Boy, I bet sold well. 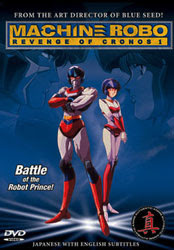 Going back to the history of the show, yes, it is nothing more than a 30 minute advertisement for Japanese toy company Popy’s second wave of Machine Robo toys, and funnily enough the line was called Revenge of Cronos. The basic story has the planet Cronos which is inhabited by robotic life forms, being invaded by an alien race called Gandora, also robotic life forms. The hero of the story is a robot called Rom Stol, who along with his sister Leina and bunch of other transformable toys, roam the land looking for the mythical energy known as the Hyribead, with the Gandoraians one step behind. Rom’s village was attacked by a bunch of Gandora robots and they killed his father, Kirai, a martial arts master. It’s pretty much the same thing every episode; Rom and company come into town (usually the local village), town is attacked/repressed by Gandora, fight ensues, Rom transforms into a big arse robot and saves the day. Repeat times 15 with little variation. The obvious problem with this show is me; I’m not in the demographic. That demographic being a mid 1980’s Japanese prepubescent boy who loves robots. The dialogue is pretty woeful. The story is predictable and crappy. However on the whole, the animation is pretty damn good. A couple of the episodes are pretty shoddy on the first disc, but it improves greatly. Admittedly I did buy the first tape of this in the late 1990’s and didn’t like it a great deal. I stupidly bought all three DVDs when CPM bit the dust. It took me a while to get through this, but surprisingly I was enjoying it quite a bit towards the end. This is probably because there was a lot more stories involving more human like characters rather than faceless robots. Surprisingly there was a little bit of fan service in the show, which was a bit weird. I think if you can suspend disbelief with the whole concept of this show (sentient mechanical beings that grow up like live creatures and die and can’t be repaired), then it’s quite fun. The animation is its greatest asset though and really shows that Japan was way ahead of western nations in this regard during the 1980’s. But story and script are what make a show, and given it’s origins it’s no surprise it fails miserably in this regard. It’s fun, but mindless stupid fun. The stupidity of the show does get annoying at times. I can only give it 5.5 out of 10.